Rated 3 out of 5 by Jordan from Serves the purpose i bought it for Pro: I am 6' 2", 195 lbs, I ordered a large. it's nice to have a coat with room in the shoulders and length down the backside. The sleeves are just long enough, any shorter I'd have to get a Tall or XL. Warm enough without being bulky, happy about that! I got a compliment on the coat on the fist day of wearing it. Cons: The snaps arent great, they come undone easily. The hood is good sized but the options for attaching it to the jacket leave something to be desired. So I dont use it. Rated 4 out of 5 by Andrew from Awesome purchase Great coat, nice and warm. The only downside is the hood. I ended up taking it off because it was awkwardly sitting but i believe it was because the material was not broken in yet and a little stiff. Rated 5 out of 5 by Wildman Wilson from Jacket is heavier than I thought! Well I've been looking for a new coat for 2 years but haven't found anyrhing I liked enough to buy! Until 3 days ago! I came across legendary whitetail on a ad on Instagram! Got to looking around and I fell in luv with coat and had to have it! It's was ordered and 3 days later I put it ongoing it was big enough since they didn't had have extra-large. I order the large and it fits perfect! I'm 5'11" and weight 160 lbs. It couldn't fit any better. The other thing I was worried about was it says it's not really for really cold weather! Well that's a lie, cuz it's been in the teens the last week here in Cincinnati Ohio with 30 mph winds at times and let me tell ya this I wear a white beater a hoodie and my coat! And my upper body does get cold at all! My leg s sure do tho lol. And the coat it blocks all that wind unlike a lot of coats I've bought! I would buy 3 more if I had the money and one for my wife ! Best 99$ I've spend in a long Time.I absolutely love everything about it! I wish they did make them for women with pink in the camo! My wife and her mom would buy one right now! 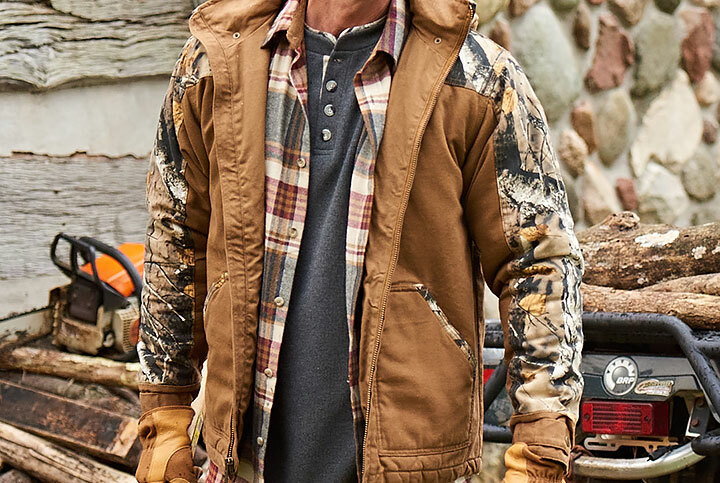 Rated 5 out of 5 by Scott from Men's workwear jacket This jacket is lightweight and warm. The fit is perfect. Very pleased with this purchase. Rated 5 out of 5 by Cliff from Very Warm I bought this jacket for my son for Christmas, and he loves it. Very warm, cuts out the wind and looks great. Received it very quickly. I have ordered alot of things from Legendary and have never been disappointed. Rated 5 out of 5 by Keith from Second one I've bought because I like it so much Love this coat! This is my second one. Very warm and comfortable! Rated 5 out of 5 by Dean from Canvas Cross Trail Jacket Perfect fit and feel. The sizing was spot on. The jacket is very comfortable. Rated 4 out of 5 by LynnK from Nice coat I bought four of these jackets last year for the men in my life. I purchased two black, one barley and one stone. My only complaint is that the black fades a lot when washed. The material holds up well. Comparable to the car♥ jackets. Rated 5 out of 5 by Glenn from Absolute quality. Very comfortable and warm. I am very impressed with the quality of this jacket. I will be a repeat customer. Rated 5 out of 5 by Rhonda from Perfect Jacket! I purchases this jacket for my husband for Christmas. He actually sent me the link. It is the perfect jacket for him. 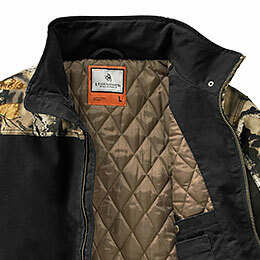 He can wear it to hunt as well as any other outdoor activity. Its not bulky and he can move around in it without feeling weighted down. It fits him perfectly as the size stated. It is made with top of the line material that I do not anticipate wearing out any time soon. Plus he loves it! Rated 4 out of 5 by Andrew from Great coat for the money This coat is true to size before and after washing. The hood comes unbuttoned easily and feels very akward to have on the coat. I took it off. The coat is very warm and doesnt allow wind to penitrate through it. Rated 5 out of 5 by Dawn from Great jacket! Great jacket! I bought this jacket for my dad. He absolutely loves it. It’s great quality and he loves that it has a hood. I’m very happy with this purchase. Rated 5 out of 5 by Julie from Great Quality Products , As Always This jacket was of great quality! It has been a warm jacket ! My fiancée loves it! Rated 5 out of 5 by Clinton from Just tring to stay warm This a great deal and being 61/2 ft tall it fit great too. Rated 5 out of 5 by Tami from Excellent Great product. I bought one for my son and husband. Both fit well and were high quality. Rated 5 out of 5 by Paul J from Great Jacket! I can't say enough about this jacket! Really good looking and excellent quality! Rated 5 out of 5 by D P C from Very solid jacket I'm 6'2 and 195 pounds, got a Large jacket and it fit great. This jacket has good quilting inside and is pretty thick canvas on the outide. Not a Carthart but pretty solid. Size and alignment of pockets is good, removable hood is nice and the back of the jacket extends down a couple extra inches to cover your back when you lean over. 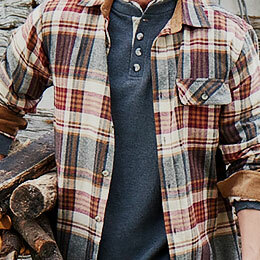 This is a nice jacket that looks better than a Carthart or Berne but is not quite as rugged. Get it at least 25% off and you are getting a great deal. Rated 4 out of 5 by Stuart61 from Good deal. Runs a bit small, so I ordered an XL, seems to fit well, sturdy construction. Rated 5 out of 5 by Liz and Nick Bartz from Husbands second love This was a gift for my husband for Christmas . He absolutely loves it and has received many compliments on it and has some friends who are extremely jealous of this coat. Rated 5 out of 5 by PATRICK from Great Jacket! this is the nicest jacket i have ever own. Fits perfect and very warm! Rated 5 out of 5 by Kevin from Perfect Christmas present I purchased the coat for a young hunting buddy for Christmas present. When he open it his dad was so impressed with the coat he ordered one for himself. Rated 5 out of 5 by Bill from Awesome! Buy it today Awesome jacket! Stylish and functional in one package. I like that the hood zips off. Sizing is on point. You will not be disappointed if you decide to purchase this jacket. I'm waiting for the cold and snow to arrive here in the Hudson Valley so I can enjoy my purchase. 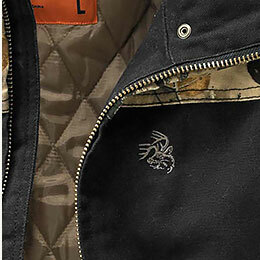 Please tell me that the sleeves have the same quilted material inside that the picture shows the inside body has. &nbsp;This would be perfect for easy on and off in tight places. Yes, the inside of this jacket is all lined with smooth polyester, including the sleeves. Been trying to get the charcoal in large for 2 YEARS!!!!! &nbsp;Why no availability? I'm sorry to say the Charcoal color has been discontinued, so we will not be restocking any sizes. I apologize for any inconvenience! 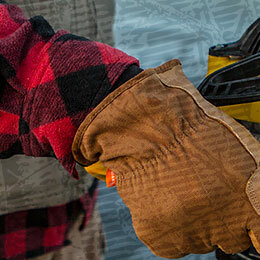 Do you have any work coats in a 3xlt? I'm sorry to say we do not currently have any jackets available in 3XL Tall. With the orange with camo on the front what colors are on the back ? The Inferno Orange jacket is all Orange on the back, with Camo on the sleeves, shoulder yolk, and a strip of Camo in the middle of the hood. Hi. 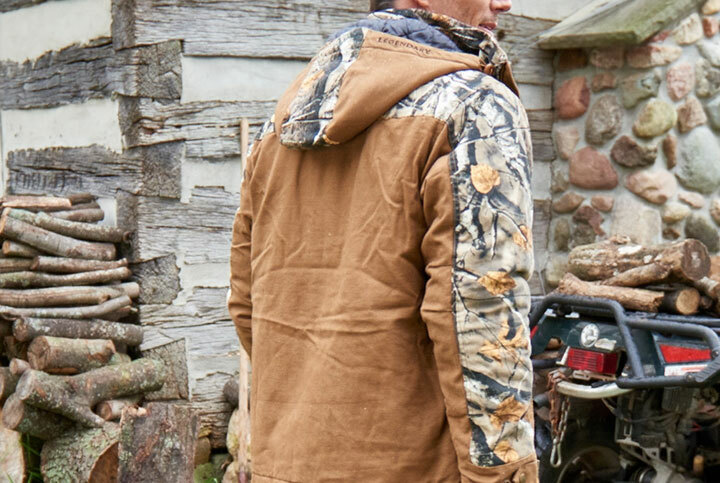 &nbsp;What is the temperature range that this jacket is designed to operate in? &nbsp;Thank you. There is not a tested temperature range; however, it does function as a winter jacket. Are the cuffs adjustable? I wear a large but have short arms. 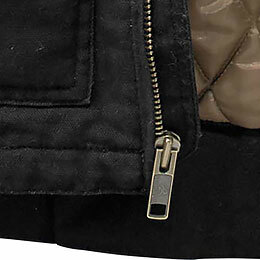 The cuffs of this jacket do have adjustable openings. Your comfort level would depend on your activity level. It has a looser fit that allows for layering. Is this a BIG and TALL ? Only the sizes LT, XLT, and 2XT are Tall sizes, the rest is regular sizing! I am looking for a deep winter jacket, is this going to keep me warm in -30&deg; weather and is it returnable if not warm enough? Although this jacket is made with a full 210 grams of insulation, it is not meant for severely cold weather, such as -30&deg;. 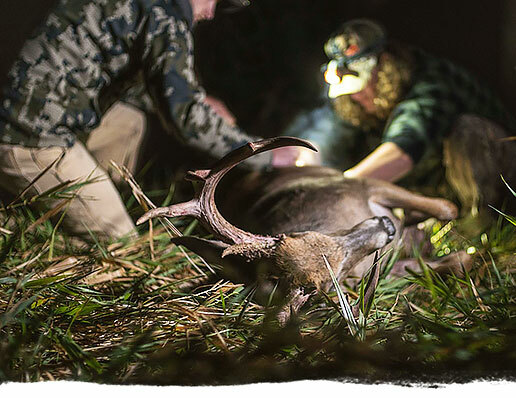 How comparable to realtree xtra is this camp? Yes, this jacket does have a zip-off hood. Is the print Real Tree? No, this is Big Game Camo. What is the camo pattern? This is Big Game Camo. Is the whole inside of the jacket nylon quilt like seen in the pictures. &nbsp;Even the arms for easy on and off? A Tall size will add 2&quot; to the body length and 1.5&quot; to the sleeves. Do the exterior pockets have zippers or are the just open concept!!? They are just open concept pockets, with no zippers. Does it have 210 gr. of insulation in the arms and is it quiet enough for bow hunting? 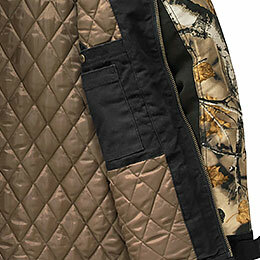 The sleeves of the canvas cross trail workwear jacket do have 210 grams of insulation in the arms. The jacket is pretty quiet do to the fabric being washed down and softer, however since it is canvas there is some noise created when the fabrics rub together. How warm is this? Is this a winter or fall jacket? The Canvas Cross Trail Jackets are very warm jackets! 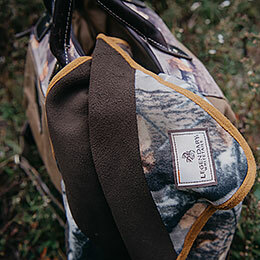 It features a heavy canvas material and is made with 120 grams of insulation to keep you warm. The ones that have a &quot;t&quot; are for tall. is this jacket water resistant ? The Canvas Cross Trail does not have a water repellant feature to it. You would be able to use your own repellent if you'd like.